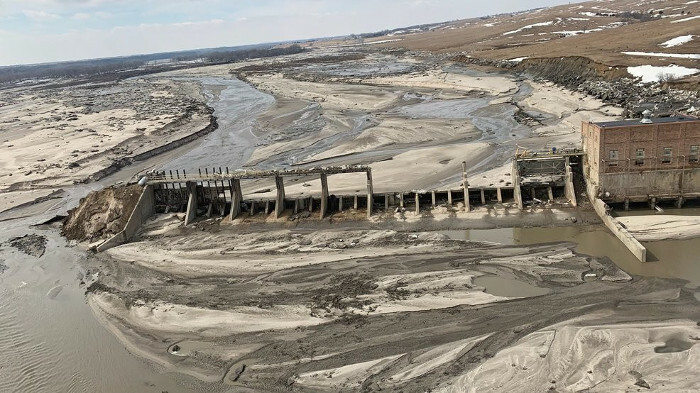 When the Spencer Dam in Nebraska collapsed in the wake of the “Bomb Cyclone” that flooded swathes of the Midwest, an 11-foot wave gushed through the breach, swallowing farms and taking down entire buildings in its swirling currents. The torrent threatened three counties downstream, which had already been trying to cope with perilously rising waters as the Niobrara River swelled with rain and snowmelt and broken ice. We have had the worst flooding in years in Nebraska. At Niobrara Valley Hospital, on March 13, despite sandbagging, the Ponca creek invaded the hospital. Even before the Spencer Dam burst, hospital workers realised there was a real possibility the rising water would flood its premises. Linda, Kelli Heiser, and all their other courageous colleagues at Niobrara Valley banded together to evacuate the patients, each of them working as hard as the others. Patients who could be discharged, were. Arrangements were made to transfer the others. After the patients were gone, “the nurses and staff continued to try to save the hospital from the water.” They faced an uphill struggle. Then, when the water receded on Friday, hospital staff and volunteers came right back to clean, so at least the Emergency Room could be available. By 7 PM that evening, the ER opened again. >Go straight to our info about how to help! Due to flooding and bridges lost, there is not a hospital within an hour drive. We have been treating patients in the ER and running clinic to give tetanus shots to people who need it. We are without running water. We have pump hand washing stations and have to use porta potties. But we are here, serving the people of the community the best we can. Niobrara Valley Hospital wasn’t the only medical facility that was confronted with the region’s sprawling flood damage. In Nebraska alone, eight nursing homes were evacuated, affecting more than 200 residents. So were two assisted living facilities. Three-fourths of Nebraska’s 93 counties declared an emergency. Over 2,000 homes and 340 businesses were either damaged or destroyed by the floods. Two Iowa cities were left without fresh water when treatment plants shut down. Lives were lost too in the floods, which followed hurricane-like winds and blizzard conditions. At least three residents of Nebraska and Iowa were killed. One of them, a Columbus farmer called James Wilke, died while trying to help emergency responders, CNN reported. He “got a call to assist emergency responders,” but “a bridge gave out while Wilke was driving his tractor over it” and “James and the tractor went down into the floodwater below”. Others, like 71-year-old Kenny Angel, are still missing. He was likely swept away along with his bar and bait shop in Spencer, Angels’ Straw Bale Saloon, pieces of which were found four to six miles downstream. “Every man-made structure in the valley was swept off the map,” his heartbroken brother Scott told the Lincoln Journal Star. Across Iowa and Nebraska, CNN reported, “farmers had little time to escape the floodwaters that rushed over their lands,” leaving their livestock and last year’s harvest behind. State officials have confirmed the cost of the damage is at least $1.3 billion, made up in equal parts of damage to roads and levees, crop losses, and cattle losses. The town of Lynch is still reeling too. Last Sunday, KNOPTV reported that “the ag community of 200 has had no running water” for a week and interviewed several Niobrara Valley Hospital nurses. “We have had to close down the hospital itself to inpatient care because we can’t properly care for them and cook for them and bathe anything like that, so we are just running the ER right now,” April Micanek, RN, told them. “We’ve never had to evacuate patients before,” she recounted. They were lucky to do so before the Spencer Dam collapsed. Even then, “the ambulance had to drive through water to get our patients” out, to the hospital in O’Neill some 40 miles south. “The good news is the water is starting to recede,” KNOPTV added, “but the long road to recovery is just beginning”. Just today, the Norfolk Daily News reported that “hundreds of people remain without running water in Boyd County and they could be facing four to eight more weeks of the same”. The Spencer Dam collapse took out the main water line feeding nearly all of Boyd County, and boring a new line will cost $1.1 million. Small-town communities across Nebraska are grappling with the aftermath of the floods. 258 miles of highway remained closed as of March 25. 177 people were still housed in shelters last weekend. Farmers and ranchers were in need of hay, volunteers, equipment, and above all: fencing supplies. Gov. Ricketts declared last Friday “Nebraska Strong Day”. All day long, donations came in to support relief efforts, totalling over $400,000 by the evening. That statewide fundraising drive is still going strong, and you can chip in from anywhere at nebraska.gov/nebraska-strong. There is a special 24-hour hotline to connect people in need with resources. The American Red Cross, United Way, Catholic Social Services and the Salvation Army are all receiving donations to help out those in need after the floods. In Boyd County, where Niobrara Valley Hospital has been struggling to cope without running water, the Rural Water District is trying to raise $400,000 to help pay for boring the new water line, and providing the district with temporary water in the meantime. Its president, Rex Black, launched a disaster fundraiser on GoFundMe that could really do with more support! Individual people have launched their own fundraisers. Take 27-year-old Alex Stepanek from St. Paul, NE. After sharing photos of the havoc wreaked by the floods, he posted a fundraiser on Facebook on March 16, asking people “to give a few bucks”. He started with a modest $5,000 goal, he told the Omaha World-Herald. Together with his high school friend Melissa Dush, they have already raised $232,000! This is the place where if your neighbor is hungry you cook for him from your best, because you know you are feeding his heart not just his stomach … This is a place where a farmer gets on his tractor and loses his life because another was in need and that’s just what we do! We don’t have oceans, we don’t have mountains and we don’t care. We have the most generous, tough, good people people you will find anywhere! We are Nebraska! Watch us America, we will show you what love looks like! One more thing anyone can do is prepare for what is likely to come still. As of March 17, some nine million people in 14 states were under a flood warning. “Major to historic river flooding” will continue across parts of the Mississippi and Missouri river basins, the National Weather Service has warned. Even this week, Eastern Nebraska and western Iowa could receive another two inches of rain. 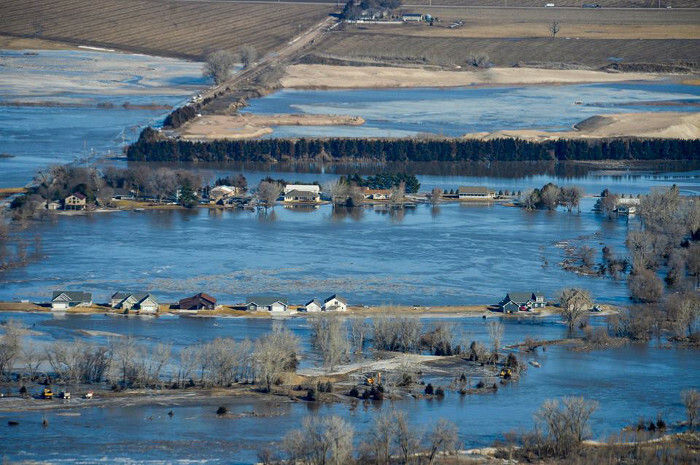 Added to more snowmelt flowing into rivers in northern states, that “would certainly send river levels higher, creating problems for homes behind levees that were weakened in the initial flooding,” The Independent reported. “We’re not done yet,” warned Iowa’s agriculture secretary Mike Naig. It’s all to do with exceptionally heavy snowfall over the winter and extraordinarily heavy rainfall this spring, which arguably tie in with “the ongoing effects of climate change”. When the ground is this saturated, meteorologist Eric Holthaus explained, “there’s nowhere for water to go but into streams and rivers, taking precious topsoil with it”. The consequences of that extend beyond the kind of practical emergencies that hit Niobrara Valley Hospital, to widespread damage to agriculture and the environment alike. None of this is supposed to be under water.